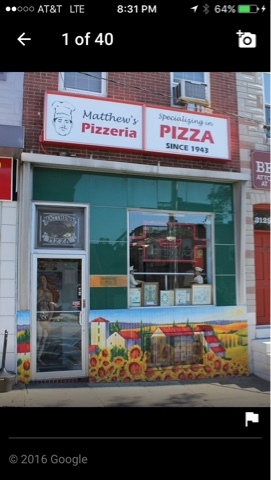 After our 18 holes of Disc Golf in Baltimore, my son and I headed over to Matthew's Pizza. This is my first time here and I don't think my son is keeping track. He likes their pizza and I'm good with what ever comes along. The place from the outside is nothing special but for the people that live around here they are all for their thicket style pizza. 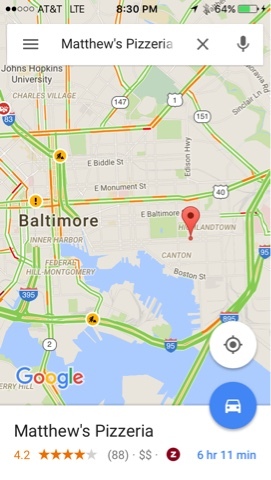 If your passing through Baltimore on I95, you are not far away to stopping by. There is only street side parking so finding a spot to park you may need to park near the park as this is a row house area with most parking for residents. 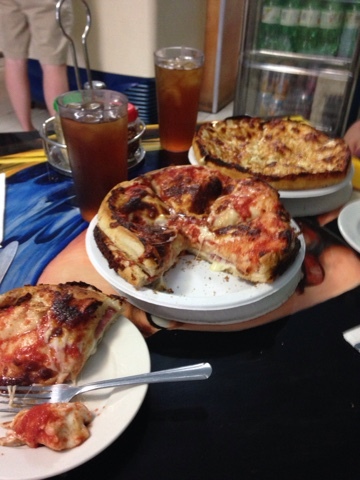 Their pizzas don't need to be big as they are thick and you get the same content in smaller slices. We got two pizzas, one was double layered with pepperoni inside and the other was crab. Both were very good and filling, that we had to take some home.